Yes, the money that you have in your hand, in your pocket and in drawer of your desk might very well be worth more if you melt it. If you had 10,000 pennies and took them to the bank right now, the bank should be able to give you a $100 bill. Essentially, $100 is 10,000 pennies. But, guess what? If you melted those 10,000 pennies and then took the melted mass of copper to a recycling center, they should give you nearly $150. That’s because a penny is worth 40% more than it’s face value. This isn’t some new revelation or new idea, but a recent trip brought up the idea again. While checking out in a market in Santiago, Chile, the cashier handed me a sparkling new 10 pesos coin. I held it in my hand and looked at it for a couple of seconds, observing it’s appearance and feeling it’s weight. It was brand new – not a scratch on it, but didn’t have that super clean look a gold or silver coin might have. It didn’t weigh a lot, but it also didn’t feel cheap either. If you’ve ever held an Indonesian rupiah coin, you know what I mean. The small coins literally feel like a piece of plastic they’re so light – because they’re made of cheap metal. But the Chilean 10 peso coin I was holding didn’t necessarily have that cheap feeling – it just felt like a regular coin. If you’ve been paying any attention to the news at all, you’ve probably heard about how strong the dollar is right now in relation to other currencies. Most notably the South African Rand, the Colombian Peso, the Mexican Peso and, of course, the Chilean Peso. It might just look like a bunch of numbers with an ominous downtrending line, but what it means is that Chileans have lost 1/3 of their buying power since the beginning of 2013. So that shiny Chilean coin lost 1/3 of it’s buying power, even though the coin itself didn’t change at all. Now, the actual cost to mint a coin has a lot to do with the type of metal of which the coin is made of, hence the example of the pennies that I mentioned in the beginning. The US Government had to change the ‘metal formula’ of the penny because the actual metal was worth more than the penny. Essentially the government was revaluing the penny for us because the currency couldn’t hold it’s value in relation to real assets. How nice of them! As frustrating as that is (that government’s fiscal policies and actions steal the value out of our monetary holdings) there are actually two interesting opportunities that have arisen. The first opportunity has to do with the penny example. The absolutely easiest way to ensure that your fiat money maintains it’s value over the long run is to denominate the currency into a metal. Gold and silver are the most popular, but really most will do. Take copper for example. US pennies minted before 1982 are worth 40% more than their face value – and that’s with copper prices at their lowest price since early 2009. Realistically, copper prices may go down even further, but eventually prices will go higher. Let’s say that you collected a whole bunch of pre-1982 pennies. Right away, you’ll be holding 40% more value than when they are used as pennies. Then let’s say that copper returns to early 2011 prices – which is double what it is now – then your penny investment will double in regards to the metal’s value. The second opportunity lies in the US dollar itself, at least the power that it holds today, February 4, 2016. As I mentioned before, the dollar has appreciated tremendously versus other currencies and assets. Gold, silver, foreign real estate, foreign exports and many other assets have literally gone on sale for holders of US dollars. If you’re not a US dollar holder, but instead have all of your money in any of the previously mentioned currencies under extreme pressure, then everything has gotten more expensive. While the details and specifics of how and why this is occurring are extremely complex, the overall cycle is very easy to understand. Basically, things that go up must come down and vice versa. Take a look at the image below. This is obviously an oversimplified and rudimentary example, but imagine that each color represents a different value. Red is the US dollar, orange is gold, yellow is oil, green is the Euro, etc. 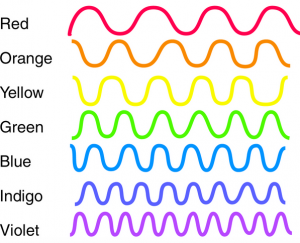 If we were to imagine that all of these wavelengths were on a similar plane, they would eventually bump into each other and effect one another. In our example we’re talking supply and demand of oil, the amount of money that a country prints, the demand for gold, the fiscal policy of the EU, etc. One action would create a reaction, and the results would create another action, and so on. Now that you have this extremely confusing example in front of you, imagine that the US dollar is at the top of one of the wavelengths. When it’s at the top it has power over everything else. It can buy lots of currencies at a discounted price, it can buy gold for a cheaper price and it can be used to finance big projects at a lower price – because everything in relation to the dollar is on a lower portion of their wavelength. What do you think is next for the dollar? Well, it’s coming back down. It might be a quick drop or it might be a slow decline, but either way, the buying power will eventually dissipate. So what should you do if you have lots of US dollars? The answer is simple. Just buy all of those assets that are on sale. Some assets are better deals than others, but nearly everything is ‘cheaper’ than they would normally be.